We had a lot of fun dancing to the music created in the Northwest 50 years ago. Some of the new instrumental tracks on this cd will remind you of what we heard back then. Remembering the music scene in the late 50’s and early 60’s in the great Seattle Tacoma area of which I was a part is always something I really enjoy. A couple of years ago the old band I played in then The Princetons got back together for a reunion and played some of the old music we played back in 1959. Nov 1958 after playing and losing my last football game in Lincoln bowl to Stadium I went to a city wide dance in South Tacoma and heard the Wailers for the first time. Their great sound completely changed my direction back then and I never played another football game much to the chagrin of Norm Mailer the Lincoln football couch then. I met Tom Hume at the dance and he told me he’s was in a band that was going to start playing Rock and roll and they were looking for a guitar player. I told him I played (hadn’t touched a guitar yet ). Well after getting a $10 Sears guitar and having three lessons I talked my mom into letting me buy a Danelectro guitar( later took the electro off so it read Dan) and a Princeton amp. I must have practiced 24 hours a day because a couple of weeks later I had a tryout with Toms band and I made it. We later called ourselves The Princetons. We practiced all through December through Xmas vacation and on about the middle of January we went on Channel 13 to play in a talent contest. We won and a week later we were playing our first gig at the Salishan gym. I still remember the stage being surrounded by girls and having to sign autographs when we finished ( one of them was a girl from Lincoln I was interested in) . I remember thinking maybe this is what I wanted to do. Its hard to explain the excitement that existed in those days playing what was the new music Rock and Roll and being even a small part of that scene that existed back then. We were lucky enough back then to be aquatint-ed with the Wailers and being asked to front them on several big dances they used to throw in the Tacoma area. A lot of time has passed since that Sunday afternoon (1959) in the New Yorker restaurant after a Princetons recording session for our manager Art Mineo watching a group of (older than us) musicians get up on stage. I remember thinking these guys probably play country music in the bars in downtown Tacoma. We weren’t to impressed until they started playing. They were really good. Art later told us they were a group called The Ventures and the tune they played was called “Walk don’t run”. Just some of the great memories of the time that remain fresh in my mind. After spending the last several years writing country tunes I did a big detour a couple of years ago and started writing rock and roll instrumentals in the genre of what I wish I was able to write back in 1959. Truthfully at the time of The Princetons I had only been playing guitar for a few months. I’m hoping some of you youngsters like me will be brought back to that time by some of my music. Maybe we can start a resurgence of that type of music again. In those days it wasn’t unusual to have 5000 kids dancing at such places as The Tacoma Armory, UPS field house and of course The Spanish Castle. Some of the bands such as Little Bill and the Blue notes had great horn players which I’m sure influenced me to write Rainbow Rock. Anyone from that era should be able to hear the influences of such bands as The Ventures and The Fabulous Wailers in my music. One of the bands I spent a lot of time listening to was the Dave Lewis group. We used to go down by the space needle in Seattle to Dave’s 5th avenue bar on weekends when I wasn’t playing to hear them. I have never heard any of his songs being recorded by other bands so I broke the ice with “Philly Dog”. A Unique Flashback to the NW sounds of the 50's and 60's. I listened to Dan's entire CD today and it brought a huge smile to my face. All but one of the cuts are original songs but you can get a hint of so many of the old NW instrumental rock standards in each of Dan's songs. Dan masterfully created sounds that immediately remind you of other bands and songs, but at the same time it is all original material. 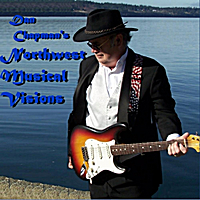 Dan Chapman has been playing the NW since the 50's, starting with The Princetons. http://pnwbands.com/princetons.html . He is still at it and sounding better than ever.